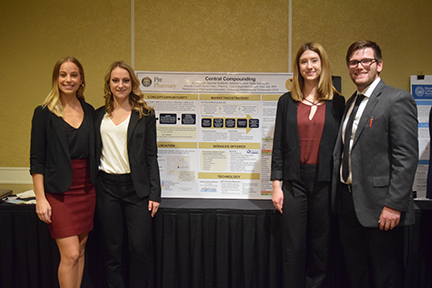 The winning team of PittPharmacy students Alyssa Lear, Katie van Golen, Julianna Slomer, and Spencer Schlecht won the Pennsylvania Pharmacists Association’s 2018 Achieving Independence Competition during PPA’s 2018 Annual Conference October 2018. Their faculty advisor was Associate Professor Karen Pater, PharmD, CDE and their Independent Coach was Dan Asti, RPh. This competition is designed to foster the budding entrepreneurial pharmacy students to one day own their own pharmacy. Students create a business plan based on either starting up a brand new pharmacy in Pennsylvania or purchasing an existing pharmacy and implement creative changes. The business plan is then developed into a poster and the students deliver an oral ten-minutes overview presentation followed by up to five minutes of questioning by the judges. Following the delivery of all presentations, the five judge panel critiques the presentations and assigns point values in various areas such as innovative concepts and creativity, feasibility, and format, to determine a winner.